I’ll never forget a comment we received in the first months of our first season. We had just released Radio Ambulante, which was a huge feat for our small team. We had to train journalists to make audio stories, raise funds, and forge partnerships, among many other things. But I think our biggest challenge at the time – as it is today – was to create an innovative program while simultaneously creating an audience for such a program. I didn’t realize the magnitude of the challenge until we received an online comment that was something like: It was a really good show, but the actors seemed very exaggerated. Clearly this listener didn’t realize that those “actors” are real people, and that all of our stories are true. Anyway, this was our challenge. That mix of voices, narration, background sound, music, and sound effects, which to us sounds like any other podcast, in Latin America sounds like a radio soap-opera. Being the show’s senior producer and sound designer I thought about this a lot in the beginning. I wanted to put myself in the place of someone who was listening to this type of production for the first time. How would the voice of the narrator, the type of music, and the rhythm of the story sound to them? I decided to anchor myself in my own preferences, hoping that in time we would develop our sound along with our audience. But still, I had one doubt – How could we make it clear to the listeners when something is real and when it isn’t? I made a simple decision: When there are real sounds, we’ll only use real sounds. When there are no real sounds, we’ll use sound effects. 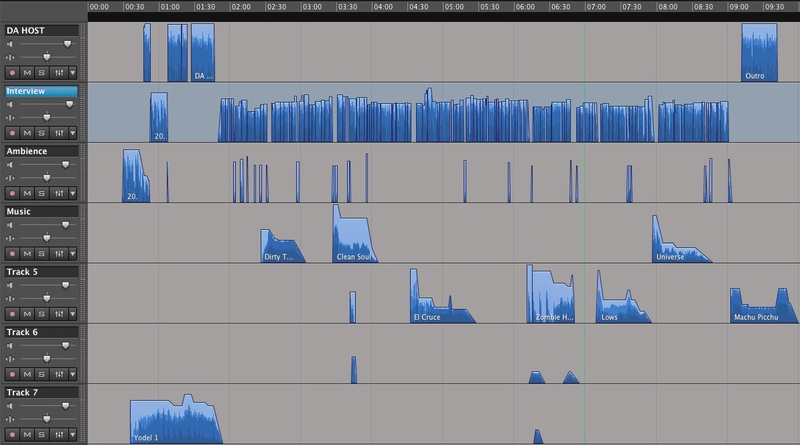 We use Hindenburg for our stories, this is an example of a typical mix of a Radio Ambulante episode. Usually, a Radio Ambulante story is made up of one or two interviews. In these cases, when there’s no ambient sound recorded by the reporter, we use sound effects to create a soundscape for the story. To be clear: these recordings are NOT recorded by us. We use a sound effects library and we also find sounds online. We also choose sounds that are a bit exaggerated to give listeners another tip that these are effects and are only there to support the narrative. But when there are scenes recorded by a reporter, for example in Night Walk or N.N. (No Name), even if it is only one scene, we then restrict ourselves to using music to support these stories’ narratives. The idea is that the listener can then trust that those sounds were recorded in the field by us. This pact with the listener was not something we said on the air, nor did we announce it on the website. But I think it’s something intuitive when you hear our episodes, as it is for me when I hear US programs that also use various sounds. I think the challenge of creating our program while we were also creating an audience has already passed into a new phase. Now it’s a matter of seeing how the show evolves because of you, the audience. Martina Castro is Co-Founder and Senior Producer of Radio Ambulante.